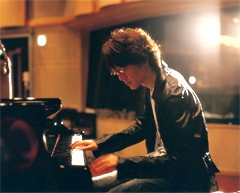 Dai Sakakibara is a professional pianist/composer/music arranger. Born in Chiba, Japan in 1967, Dai started playing the piano at the age of 4.
he formed an instrumental band G-CLEF with his friends in 1989. They made a striking debut with their first album Pell-Mell from Sony Record. field and received high appraisal. for their second album, Goemon (Sony Record). Kazumi Watanabe, one of the most renowned guitarists in Japan. He also composed and did arrangements for TV drama and featured film soundtracks. compose and arrange regardless of genre. Dai launched an eagerly awaited solo album named Trans- (BMG Japan) in January 2001. His second album Tomorrow followed in 2002, which extended its market to South Korea. a worldwide-release compilation album,Pachelbel’s Greatest Hit: The Ultimate Canon. mainland China, Dai’s career is expanding internationally. Dai’s third album, As for You was released in 2004. His Blue Note tour (Osaka, Nagoya and Fukuoka) was a great success. a TV series recognized as among the most popular and emblematic in Japan. the other music for every episode. Dai’s forth album, Piano +, in July. His nationwide concert tour had a strong turnout at each venue. Dai’s fifth album, Kazeiro- was released in 2007, and his concert DVD released in 2009.